I feel that eggplant is very under-utilized in the kitchen and I have grown to like it more and more every time I cook with it. I grew up not caring for it, which is why I venture into cooking items like this. Young (early spring) eggplants are not normally bitter but when you get into the fall season the bitterness increases. The bitterness comes from phenol’s which are found in numerous different types of plants and is a defense against herbivorous. There are two ways of removing this flavor; the first is by slicing the eggplant, salting the flesh, and letting it sit for an hour or so in a colander. After it has set, you will see little droplets of water that were pulled from the eggplant, just pat it dry with a towel before using it. The second approach, which I use most often, is to make a “brine” with salt and water. For eggplant you want the brine to be salted enough so you can taste it in the water. Drain the eggplant. Melt the butter and when the milky solids have separated out and begin to brown, add the eggplant and sautée for about 5 minutes. In a separate bowl, combine the cheeses, egg, lemon, orange zest, and herbs and mix by folding; too harsh of mixing could result in the mascarpone breaking. The process for filling the ravioli’s can be found here. 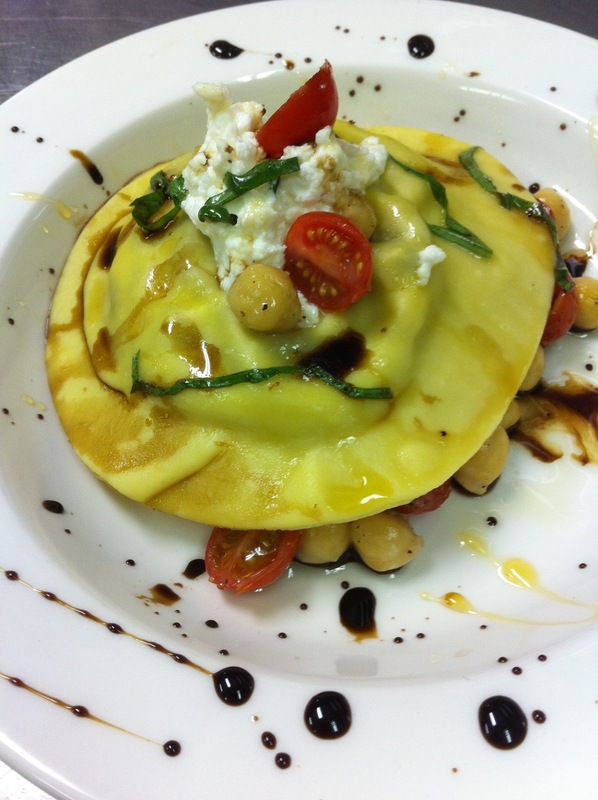 Eggplant ravioli, truffle chickpea salad, chestnut honey, and house made ricotta.